Last month Joovy introduced a very cool tricycle that they are calling the Tricycoo. It’s designed for toddlers as young as 18 months old. I know you’re asking how on earth a toddler will be able to maneuver the tricycle but you needn’t worry – your child does not need to steer, pedal or balance on their own. They simply enjoy the fun and independence of their first tricycle while you guide them with the removable parent push handle. 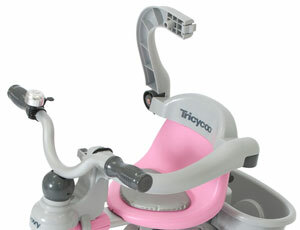 When engaged, the parent push handle overrides the steering on the Tricycoo. – I personally love this feature! We were given another brand of tricycle as a gift and the problem I have with it, is that my son can still grab the handlebars and “steer” (which usually means swerving from side to side) making it challenge to get anyplace. With the parent handle overriding the steering on the Tricycoo our walks have become a pleasant and fun time for both my son and I. 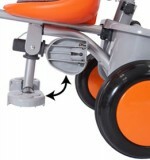 The Tricycoo grows with your child – once old enough the parent push handle can be removed, the foot rest can be raised so that he/she can pedal on her own, and the “baby surround arms” that keep your baby from falling off the seat can also be removed making it perfect for a child up to 44lbs. Quiet wheels! – Yes, I said quiet! Many outdoor ride-on toys have hard plastic wheels that make the most annoying loud sounds. The Tricycoo sports injection-molded wheels with urethane treads that make them quiet on most surfaces. Assembly – Once I received the Tricycoo I excitedly opened the box and lay all the parts on my floor. I pulled out the manual and prepared myself for assembly. As with most manuals, you’ll find that a list of parts is included, don’t make the mistake I did – I began to panic thinking that I was missing parts but after a few minutes I discovered that the Axle was inside the parent push handle and one of the knob nuts was already attached to the seat (I assume for ease of packing). The manual it’s self is very easy to follow, and the Tricycoo was fully assembled in under 20min with relative ease. 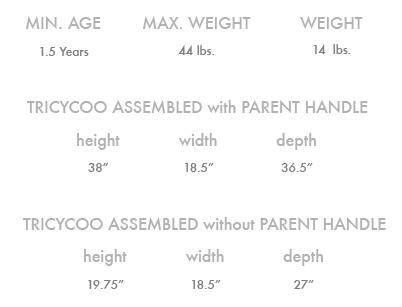 I mentioned earlier that the Tricycoo features removable baby surround arms, the arms are designed to safely enclose your child on the seat. Coupled with the fold down footrest, both features are designed to give more stability to your child while giving them the confidence and support they need to perfect their balancing skills. My son was quickly drawn to the bell on the handlebar and loves to make it “ding”. Another feature that both he and I love is the attached rear basket/bucket – it came in super handy to stow a few toys for him and my house keys and cell phone. 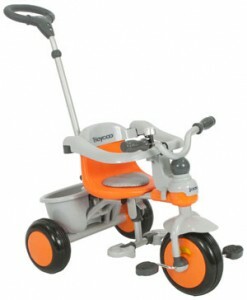 We’ve used our Tricycoo for many trips to the park and have found it easy to maneuver on both pavement and grass. The steel frame makes it very durable and long lasting. It’s available for $99.99 in four fun colors (orange, pink, black and green). 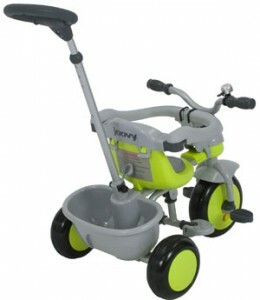 The Joovy Tricycoo is a hit in my house and I’m sure it would be in yours!